My skin tingles with the chill of resurrecting each detail of the murder. She fights, tries to run away. (The bruises and small abrasions on her arms and neck.) The killer stabs her at the foot of the bed. He is horrified, yet wildly excited about what he has done. She doesn't die immediately. He has no choice. He has to stab her again. And once more. 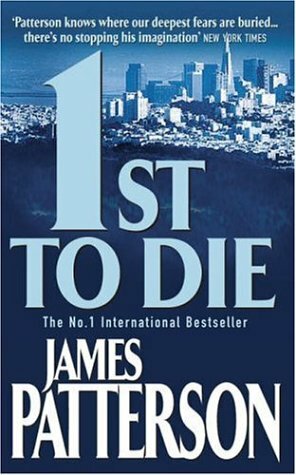 - p. 79 1st to Die by James Patterson. Yikes! This is exactly why I haven't read any of these books...you start one and the next thing you know I've added 100 of his books to my TBR. Thanks for stopping by! Haha, yeah James Patterson is great! Yeah, he is very crazy. He's a serial killer of newlyweds! Thanks for tagging me, I'll check it out. I've never read anything by Patterson, but it sounds great! This is my first JP book and I'm loving it so far. Well; Patterson is a winner in my book!